Apart from standard attributes, we can add some more attributes as per our requirements. These attributes would be useful for record search and reporting purpose. We can use standard RMS_ID ‘ASR_DPF’, which is the top entity under that we will keep all DPF related stuff. I used standard Service Providers for Archive link documents, BOR objects, HCM Infotypes, General documents, Records and Record Models. Under Service Providers, we will create custom element types for record model by copying standard element types or we can use standard ones as it is. We will do this in tcode: SRMREGEDIT. In element type we have to assign classification parameters and connection parameter values based on type of element. The important connection parameter is document class which would be the content repository for that particular element. 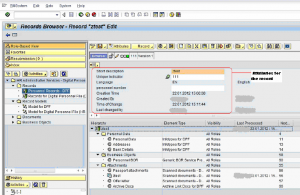 DPF(Digital Personnel Files) functionality in HCM, appears under HR Administrator services which is mainly based on SAP Records Management (better known as SAP Netweaver Folders Management). 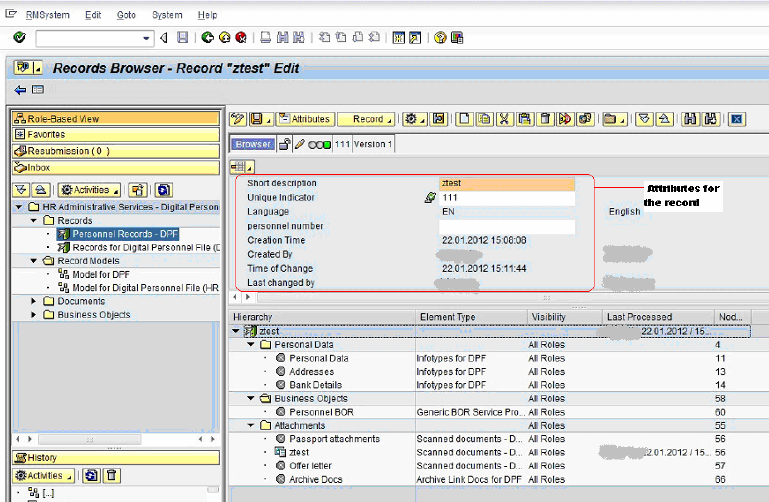 create a record model (tcode: ORGAZINER), which will have a folder structure that should appear as record. RIM’s SAP Environment§RIM has been using SAP solutions since 2001 and HR since 2002§Current SAP version: ECC 6.0§Modules:§HR, FI/CO, SD, CFM, MM, PP, WM, QM, PA, plus other SAP products such as BI and CRM§One global instance supporting 5000+ usersRIM Objectives§Handling a constantly changing workforce§Org chart posted daily§Handling rapid global growth§Continue business process improvements and provide tools, training and communications related to various programs and projects.§Provide solutions, information and innovation in support of Corporate and OD Objectives / Strategies. What is HANA? 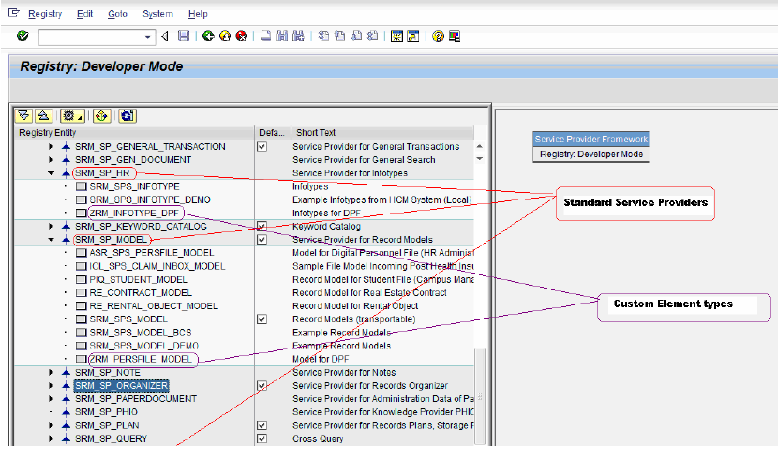 It is an in-memory DB from SAP. SAP (SAP +2.9%) closes higher after announcing its core Business Suite ERP, CRM, and HR apps will now be supported by its popular Hana in-memory database. This significantly expands the addressable market for Hana, whose ability to enable real-time analytics and reporting for other SAP apps has already fueled blistering growth. Bernstein has predicted Hana support will also be extended to non-SAP apps. Oracle (ORCL) is trying to counter Hana via its costly Exadata X3 system. o Ensures functional and technical AMO documentation is updated following technical changes or HRSP implementations. Documentation and HRW must be up to date in order to enable other consultants to progress the work in case of an emergency. Knows SAS 70 and (local) compliance agreements. Working experience in the related field is required for this position. Experienced Employees specializing in IT/Computer – Software or equivalent. SAP’s rulebook allows employees to work one day a week from home. SAP in India assigns a cab to a pregnant employee from her seventh month of pregnancy, which she can use to commute to work. She is assigned a buddy at the workplace — some one who is a mother already — with whom the pregnant employee can discuss problems and mood swings that she may be experiencing. V R Ferose, till recently the head of SAP Labs India, started a programme to hire autistic people as employees. The autistic employees are also assigned buddies (another employee) to ensure they do not run into problems at work. SAP ERP system uses Payroll Areas to group employees for whom payroll should be run together, and at the same time. You can perform payroll separately for different employee groups, using different payroll areas. Which payroll area the employee belongs to depends on his or her organizational assignment. Employees who belong to different company codes can, for example, be grouped in the same payroll area. SAP recommends that you use few Payroll areas as possible. For example, an organization may pay employees on 28th of the current period and another at the beginning of the subsequent month so at least two payroll areas must be created. * Determines the exact Payroll Period. 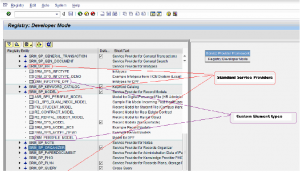 * Select the personnel numbers grouped under the Payroll Area.